Our MBA is student-centric and is focused on your career development. It blends academia and practical applications whilst building your confidence and competency through personal experiences. You will develop skills across a range of business functions including strategy, accounting, economics, operations management, people management, commercialisation, business development and marketing. You will attend our on-campus nine-day Leadership Week and conduct a Consultancy Project for a client organisation. Our Online MBA is ranked equal 1st in the world for Class Experience and 2nd in the world for Faculty and Teaching by QS Distance Online MBA Global Rankings 2018. You will learn the fundamentals and key decision-making that take place in business functions within the business environment and then apply this at a strategic level. You will attend our nine-day Leadership Week event and utilise your knowledge and skills in an applied business context in the Consultancy Project. You will develop an in-depth understanding and gain experience of decision making in relation to a range of business functions including Accounting and Corporate Finance, Operations, Strategic Analysis and People Management. You will continue to develop your understanding of various business functions including Business Development, Marketing and Sales, and develop a commercialisation plan for a technology-based project. You will participate in our 9-day Leadership Week event which includes a Business Simulation Exercise, academic and practical workshops, outdoor leadership development day, and guest speakers from academia and industry. You will utilise your knowledge and skills in an applied business context, for a client organisation (typically for your employer), through the Consultancy Project. 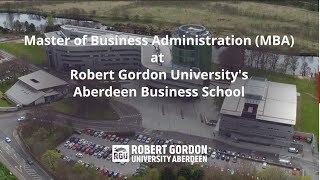 The project is supported by a tutor from RGU and is designed so that the project recommendations bring real value to the client organisation. You will learn through a combination of lectures, seminars and workshop sessions which compromise of a mix of group study, simulation, case studies and presentations. You will attend weekend workshops at our Garthdee Campus, of which you are required to attend approximately 16-20 days per year for the first two years. You will have access to your learning materials from home/remotely through our online virtual learning environment, CampusMoodle. You will learn via our online virtual learning environment, CampusMoodle which provides you with lectures and course materials and allows you to study from any location. You will participate in active, group-related learning within a supportive online community setting. You will participate in our 9-day Leadership Week event, held on campus, which includes a Business Simulation Exercise, academic and practical workshops, outdoor leadership development day, and guest speakers from academia and industry. You will have the opportunity to meet and network with fellow MBA students across all modes of study and industry experts from local and national businesses. The total learning effort on the course is the equivalent of 1800 hours over 12 months (full time) or 33 months (part time or online distance). This is to include independent study and coursework preparation, workshops, lectures and other activities. The MBA programme is taught by industry experts and leading academics who have had successful careers within the corporate world. One of our staff members on the programme is a Fellow of the Energy Institute, and two members of staff are Members of the Energy Institute, which ensures the teaching on the course is of the highest standard and relevance to industry. We work closely with CEO’s, directors and key managers in industry to design and continuously develop our MBA offering and ensure the curriculum is relevant and appropriate to the needs of senior managers of the future. Within the Consultancy Project you will act as a consultant for a business on an agreed issue relating to its operations. It allows you to apply your knowledge, leadership and strategic thinking skills within a practical context, face challenges of working within new settings, apply learning to new problems and earn valuable experience of working in a multi-national environment. All projects are strategic in nature and focus on real opportunities facing an organisation or government department/agency. Previous projects have ranged from developing an international gas utilisation and monetisation strategy in West Africa to developing a global strategy and franchising for a major oil company. You can also use the Consultancy Project as an opportunity to produce a business plan for your own entrepreneurial ventures. An MBA is an internationally recognised qualification which will help you to capitalise on your experience to date and build on your previous qualifications. On completion, you will be able to take that next step in your career to a senior leadership position either within your existing organisation, a new organisation or on setting up your own business. Our MBA Careers and Employability programme comprises of a suite of workshops designed to stimulate your thinking, put you in control of your career planning and prepare you to compete effectively in the employment market. Previous graduates have gone on to launch their own business, lead multi-national organisations and progress into roles such as CEO, Senior Vice President, and UK Country manager. Applicants must normally hold a 2:2 undergraduate honours degree or its equivalent in any subject discipline and have at least 3 years of full-time professional work experience. Completion of ACCA Applied Skills Modules to BSc level combined with 3 years relevant professional work experience OR completion of ACCA Strategic Professional Modules* to MSc Level combined with 3 years relevant professional work experience. ​*Where this ACCA qualification has been achieved in the 5 year period preceding the MBA start date you may be considered for an exemption from module BSM013 Financial Management Accounting. The accreditation is a recognition of the quality of teaching…….Each course lends itself to a slightly different style and that is very useful because in your working life you will encounter different styles and you will need to be able to adjust to manage those. It is also recognised by the Chartered Management Institute (CMI).